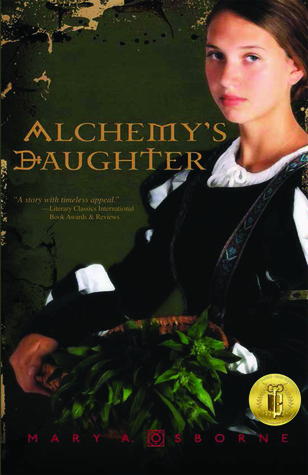 Mary A. Osborne in her new book, “ Alchemy’s Daughter” Book Two in the Alchemy series published by Lake Street Press introduces us to Santina Pietra. From the back cover: Santina Pietra is seventeen and in medieval San Gimignano, daughters of merchants are expected to marry. But Santina cares only for Calandrino, a brilliant young scholar who is preoccupied with his ancient alchemical texts. The setting is 14th century Italy, yet in Santina contemporary readers will discover a strong-minded young woman whose search for meaning echoes their own. Alchemy. Can you imagine a time when what would be “modern” medicine then would be considered witchcraft? This is a historical novel. This is a coming of age novel. There is a lot going on with the development of medicine, herbal medicinal cures as well as the Black Plague. There are sections that are quite exciting. There is even a romance. This is an exploration of a time that is long gone but is still fascinating. Ms. Osborne has given us lots of characters to keep us interested and to show us what people thought back then and how difficult it was to present new ideas. I found this fascinating.